The nave and chancel are later C11, with C14 modifications, particularly to the chancel. 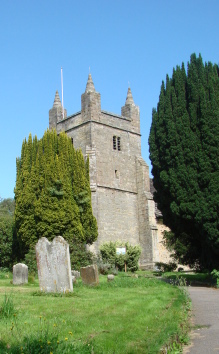 A tower was added in 1536-38 and a north aisle in 1853. Of the C11 church, the south wall of the nave and most of the chancel remain. Despite the tall, narrow proportions of the south doorway, particularly evident on the rere-arch, it is not pre-Conquest work, but is no earlier than the late C11. Whilst John Potter has discerned evidence of pre-Conquest techniques of masonry, these do not extend to the doorway (SAC 145 (2007) p83) and he does not suggest an overall date for the structure. The carving and form of the doorway recall those at Wivelsfield, East Sussex (nearby) and Stopham. W H Godfrey (5 p103) suggests it is early C12 and though this seems late, the most recent study differs little in suggesting a date of c1100 (www.crsbi.ac.uk retrieved on 1/4/2013). The head has two orders of shallow reeded bands and the abaci do not project, as they have been cut back. Quartermain (W p26) shows chevrons on them, which have gone. The jambs may also been cut back (VCH 7 p139), but this cannot have been by very much and there are signs of a former tympanum. Also early is the plain door itself. Until 1853 there was a similar but undecorated north doorway and some blocked original windows (3 p61), including one to the south, shown by Nibbs (1851), where there is now a larger C19 one. 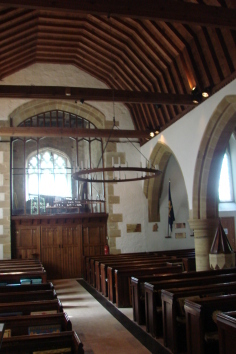 The chancel, which is deflected to the north, has two original side-windows – their position near the centre suggests it was never significantly lengthened. We have only descriptions of the low triple chancel arch replaced in 1840. The centre opening sounds C12, since it had zigzag mouldings on the head (3 ibid). The smaller flanking arches were probably similar to those at Pyecombe. In the C14, the chancel windows were replaced. The new east one has Y-tracery and there is a trefoil-headed lowside to the south. If the chancel was lengthened, for reasons already mentioned this cannot have been by much. The two-light square-headed south east window of the nave is of the same date or a little later. The tower can be precisely dated and the names of the craftsmen are known, thanks to the surviving accounts. These were generally thought to be those of the churchwardens but the most recent assessment (see 1 passim) suggests that they were in fact the private accounts of John Bolney, the main instigator of the work. These suggest that construction started in 1536 and was largely complete by the following year, although the fitting out appears not to have been completed until 1540. The actual period that the masons were at work was thus under a year which seems remarkably short. although Byng notes at least one comparable case (1 p105). The mason was T Pokyll or Puckyll (see 1 and 2), some of whose workers are also named in the accounts. Their names occur elsewhere in connection with Pokyll and were thus likely to have been close associates. However, R Frogbrook, a local man, was responsible for the timberwork and this must have been a purely one-off arrangement. Remarkably, other references to Pokyll have been found, including one by John Harvey (Dictionary p113). 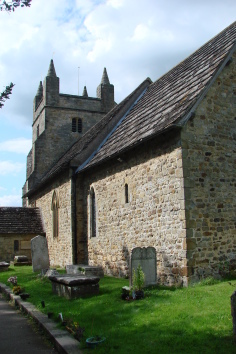 The tower is built of coursed ashlar, unlike the rubble of the rest of the church, and has diagonal buttresses and a heavy north-east stair turret. The renewed west window and doorway are contemporary in type. The left-hand spandrel of the doorway contains the arms of John Bolney and the right-hand one contains those of Bolney quartered with those of the Kentish family of St Leger, to whom he was related through his mother (1 p110). No record of a donation by John Bolney exists, though it seems likely that he was involved financially as well as organisationally, and there is a record of a donation or bequest, possibly never made, by his brother James in 1536 (SRS 41 p164), which would have been a substantial amount The depressed chamfered head of the tower arch dies into square responds. The only part of the tower that looks wrong for the date is the heavy plain parapet with plain, clumsy pinnacles. Conceivably it was only completed in the C17 or C18. 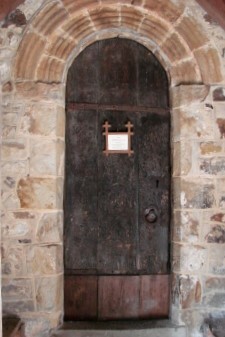 Evidence of work then includes the plain stone south porch, dated 1718. It replaced a timber one of unknown date (3 p60). 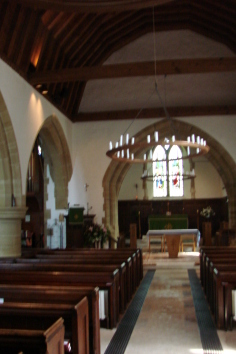 Changes in the C19 started with the replacement of the chancel arch in 1840. The best source of information is Joseph Dale, vicar from 1849 to 1860 and himself responsible for much of the work. In 1850 he placed a sundial on the porch gable and in 1853-54 added the broad north aisle, using H Woodyer as architect (ICBS). It is built of irregular masonry, streaky in colour, with a three-bay arcade of C13 pattern. At the same time the chancel arch, only 13 years old, was made lower to match the arcade and the tower arch was opened up (4 p402). Dale repaired the rest of the church and negotiated with the Ecclesiastical Commissioners over a survey by E Christian (ibid). Further alterations included a new south east nave window, but it is not known if it is Christian’s work. 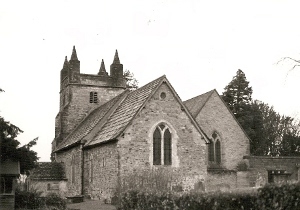 By 1901 the church needed further repair and J F Bentley undertook a general restoration (CDG 87 (1901) p33 and 88 p47), including new pine roofs; the Horsham slabs were retained. 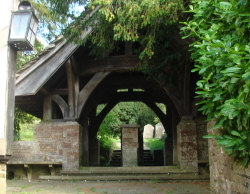 In 1906 E T Powell designed a new lychgate (CDG 150 (1906) p86), low-proportioned with overhanging eaves. It is unusually substantial, incorporating locally found millstones and with a roof of Horsham slabs. The large flat-roofed north vestry dates from 1912 (Meads) and may be the unspecified addition to Bolney church claimed in his entry in WWA 1914 by T Tyrwhitt. Font: Polygonal bowl with zigzags cut into the base and designed by Woodyer (3 p62). 1. (East window) Burlison and Grylls, c1905 (Attr – www.stainedglassrecords.org retrieved on 4/2/2013) in place of one by J Powell and Sons, 1854 (4 ibid). 2. (South west chancel lancet) M E A Rope, 1947 (DSGW 1958). 3. (North aisle, first window) H Easton, 1953 (signed). 4. (South west nave window) Cox and Barnard, 1982 (signed). Panelling: (Behind the altar) Mostly plain C17 panelling reset. Piscina: (South chancel) Plain pointed with a restored bowl, probably C13. Rails: (Fomerly) C18 altar rails with turned balusters. Royal Arms: (South east nave) Queen Anne, post Union of 1707. Square painted panel.